Rusty paper clip mark and resultant tear to corner of about five pages; some soil. 9 pages, with additional printed folio leaf on newsprint. Sam Darcy, a high ranking official in CPUSA, had been dispatched by party chairman Earl Browder, who viewed him as a rival, to the west coast, on the notion that he would slip into obscurity. In San Francisco, Darcy became even more influential, organizing farm workers and maritime workers and heading up the 1934 strike of longshoremen. This file centers on Darcy's arrest and incarceration on a charge of perjury. In 1941, he was convicted of having lied on his voter registration application upon moving to California, by misstating his place of birth. His case became a rallying point for the left, as it was clear that Darcy was being persecuted for his political beliefs. The present file consists of the following: 3 TLS from Darcy's wife Emma to John M. Weatherwax, a communist activist and sometime journallst in LA, who served as a go-between for Darcy and the Pasadena patron of left-wing causes, Kate Crane-Gartz. 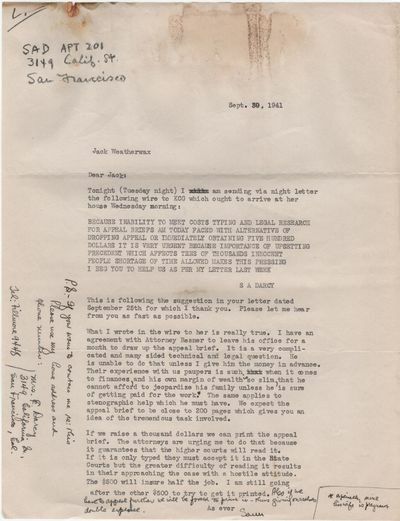 A carbon TL and a two-page carbon TLS, annotated, from Darcy to Mrs. Gartz, first thanking her for her poem about him, and second asking at length for her financial backing for his appeal; TLS from Darcy to Weatherwax, amplifying his plea for help. Along with one of Emma Darcy's letters, she has included a three-page typescript statement by Sam Darcy, written as a kind of letter to his supporters while he was jailed, in which he argues in his own defense as a victim of political persecution and appeals to a patriotic understanding of American civil liberties. Also present is a printed copy of a full-page newspaper ad that Darcy's camp ran in the communist "People's World' under the headline "Are You A Criminal? You Don't Know Yet--" and going on to list numerous officials and prominent citizens who had made similar bureaucratic paperwork errors and suffered no consequence. A rare and substantive file from a significant chapter in the history of the American left. 1 Bd., überw. ill., 32 cm Gebundene Ausgabe, OLn. m. Ou, Kassette Volume 2 1934-1936. Faks. Nachdruck der Nummern 5, 6 , 7, 8. Ganzleineneinband m. Schutzumschlag und Kassette. Mit Beiträgen von / über Jacques Audiberti, Albert Béguin, André Breton, Jacques C. Brunius, Roger Caillois, Nicolas Calas, Salvador Dali, Marcel Duchamp, Paul Eluard, Jean Giono, Maurice Heine, Georges Hugnet, Edward James, Madeleine Landsberg, Le Corbusier, Pierre Mabille, René Magritte, Henri Matisse, Matta Echaurren, Benjamin Péret, Jacques Prévert, Man Ray, Maurice Raynal, Kurt Seligmann, E. Tériade, Raoul Ubac. + + + Schutzumschlag tls. dezent nachgedunkelt, sonst auber und sehr gut erhalten. Werktäglicher Versand. Jede Lieferung m. ordentl. Rechnung und ausgew. MwSt. Der Versand erfolgt als Büchersendung / Einschreiben mit der Deutschen Post bzw. als Päckchen / Paket mit DHL. Die Lieferzeit ist abhängig von der Versandart und beträgt innerhalb Deutschlands 3-5 Tage, in der EU 5 - 12 Tage. 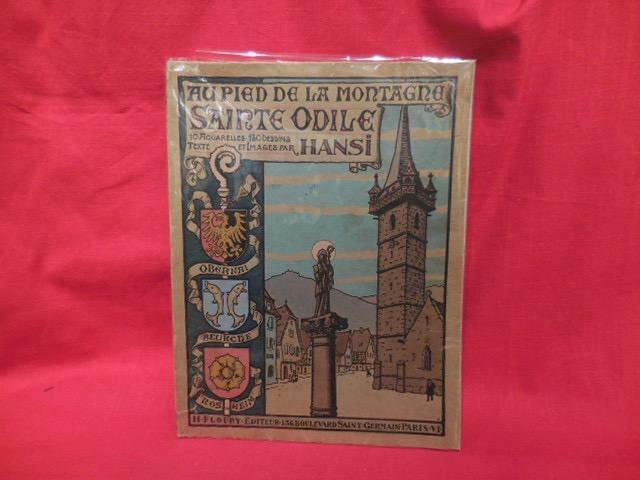 Au pied de la montagne Sainte-Odile (Obernai-B?rsch-Rosheim). New York: Alfred A. Knopf, 1934. First American Edition. Hard Cover. Very Good/No Jacket. Octavo. 372 pages; original black cloth, spine stamped in gold; a very good copy, internally clean and bright, with no markings of any kind. New York: Ray Long & Richard R. Smith, 1934 - Tall quarto. 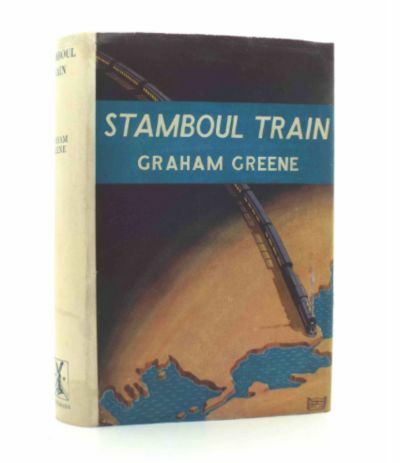 Original buckram, titles to spine and front board in black, pictorial endpapers. With the dust jacket. Small ownership inscription to first blank. Spine and board edges tanned, internally fresh. An excellent copy in the jacket with toned spine and some shallow chips to extremities. Frontispiece and 60 full-page illustrations by Hugo Gellert. 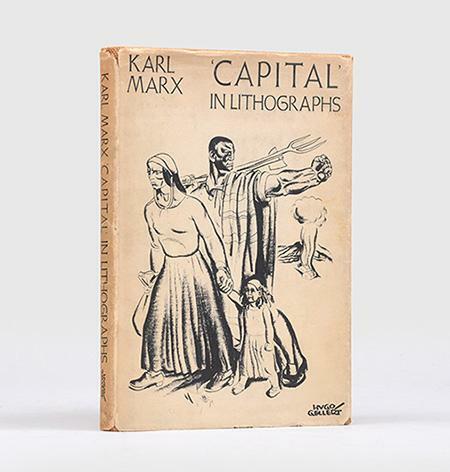 First Gellert edition, first printing, of this graphic rendering of Das Kapital by the Hungarian-born American artist Hugo Gellert (1892-1985). The accompanying text is from the translations of Ernest Untermann, the first American translator of Kapital, and Eden and Cedar Paul. 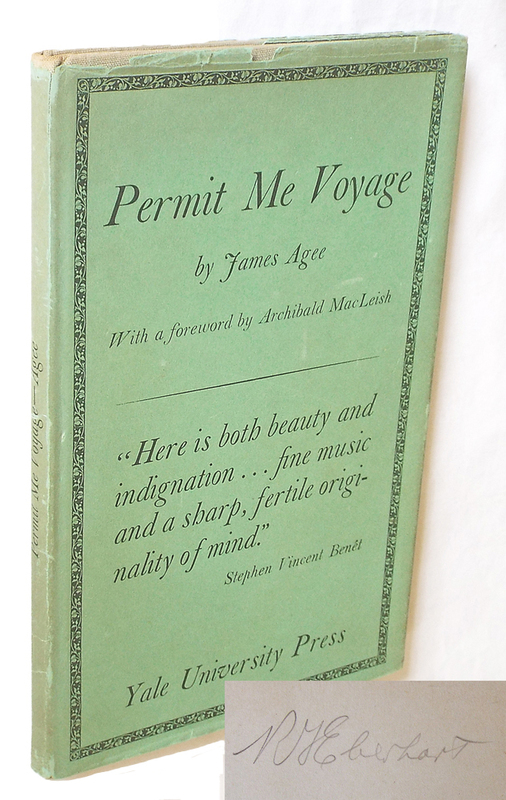 An attractive copy and rare in the dust jacket. Autograph letter signed "Po Mascagni" to the famed Italian composer Ottorino Respighi. 1 page (ca. 106 x 136 mm.). Dated Rome, December 25, 1934. On a notecard with the emblem and name of the Reale Accademia d'Italia embossed in blue to upper left corner. In Italian (with translation). With original autograph envelope, ca. 112 x 143 mm., addressed "a Sua Eccelenza Maestro Ottorino Respighi Teatro Reale dell' Opera - Roma" with the name and emblem of the Accademia embossed to verso. "I am sorry for not having attended the performance of Fiamma. I offer my sincere congratulations on the success that has crowned [your] noble endeavor... "
Edges very lightly browned; minor remnants of adhesive to corners of blank verso; envelope slighlty worn. Together with a vintage bust-length photograph of a youngish Mascagni in profile. Ca. 206 x 127 mm. Slightly worn; minor remnants of adhesive to blank verso. La fiamma (1931-3), Respighi's "last and most frequently performed large-scale opera," was first performed at the Opera in Rome on January 23, 1934. John C.G. Waterhouse, et al. in Grove Music Online. Mascagni, distinguished as both a composer and conductor, is perhaps best-known for his opera Cavalleria rusticana, which "was enormously successful from its first performance at the Costanzi in Rome in 1890. From then on Mascagni spent the rest of his long career treating a wide variety of subjects. His next opera, L'amico Fritz (1891), consolidated his success with Roman audiences, and revealed his lyrical vein. This fluent rustic comedy was successful particularly because melodic vitality - the outstanding merit of Cavalleria - was combined with a more elegant harmonic idiom." Michele Girardi in Grove Music Online. London: W. and R. Cahmbers. 1934. First magazine issue publication of Buchan's The Free Fishers, published in Chambers Journal between January and July 1934. Publisher's decorated orange paper wraps. Bright and clean, minor edgewear, very good indeed with some very minor chipping to spine ends and edges. A very bright clean set. In addition to the Buchan there's the usual smattering of adventure fiction, articles on Oyster Culture in Scotland, how to secure Australia against the Dingo menace and a blizzard of advertisments for pipe tobacco, support garments, catarrh cures and the treatment of mental health issues vying for place with cases of thin wine biscuits and a "useful folding cake stand". Splendid stuff, scarce in periodical form and even scarcer in this splendid condition. Edizioni di Solaria, 1934. . 16mo. pp. 254. Ottimo (Fine). Prima edizione (First Edition). Possible Production of Elements of Atomic Number Higher than 92. London: Macmillan, 1934. 1st Edition. Hardcover. 4to - over 9¾ - 12" tall. In: Nature 133, June 16, 1933, pp. 898-899. 4to. ----D.S.B. Fermi 99, Norman 784 - Shortly after Joliot and Joliot-Curie's discovery of artificial radioactivity produced by alpha-particle bombardment of stable nuclei, Fermi and his assistants began a line of similar experiments using neutrons as projectiles, since neutrons. Very Good. (Paris: Société des Moteurs Salmson, 1934). Quarto. (8)ff. Catalogue promoting the Salmson S4D, from French automaker Société des Moteurs Salmson, illustrated throughout with black & white photographs depicting the interior, exterior, motor, and chassis of the vehicle. At the center of the booklet are five loose color posters with illustrations in a bold Art Deco style. The posters proclaim the merits of each body style of the S4D: for example, the "Précision" of the Cabriolet roadster, which is depicted alongside a jet engine, and the "Élégance" of the Demi-Berline sedan. Bound in bright violet printed wrappers bearing the name "Salmson S4D" in tall letters and a depiction of the sleek "Faux-Cabriolet." Advertising postcard and price list bearing dealership stamp laid in. Founded as a manufacturer of heavy-duty components for the military and railway, Salmson did not enter into automobile production until after World War One. Technically innovative, the models promoted in this brochure boasted independent front suspensions and an electro-mechanical gearbox. A few slight spots of rubbing to covers, else fine. Preliminary Bonneville Power Navigation Project. Five maps/diagrams. War Department Corps of Engineers U.S. Army. 1934. Five blue print maps/diagrams, sheet size 21 x 32 inches, two staples at left edge. A few small corner creases; very good condition. Includes General Site Map, Spillway Dam Plan and Section of Foundation Exploration, Typical Sections Spillway Dam & Abutments, Spillway Dam Cofferdam Layout, and Spillway Dam Crib Sections. Plus smaller diagram stapled to front "Summary Hydragraph Columbia River at Bonneville"
Liebmann Breweries Inc. Calendar for 1934. Map of Manhattan, Principal Sections of Bronx - Queens - Brooklyn./ Map of New York and Vicinity. Liebmann Breweries, Inc. 1934. Color poster calendar 38 1/2 x 25 inches, metal bands at upper and lower edges. Line of small spots across the calendar portion of the poster (appears to be rust marks from being stored rolled with one of the metal bands touching the paper), a couple of tiny edge tears and spots, light creasing from being rolled. Overall in very good condition. Double sided poster calendar with the message "All Roads lead to Rheingold and Gold Old Scotch Ale." On each of the detailed maps of the region the location of the Breweries is prominently marked in red with a star. The Map of New York & Vicinity stretches from Rumson Neck and Sandy Hook to the south, the area just west of Elizabeth, Newark and Paterson to the west, Nyack and Tarrytown in the north and Hempsted in the east. The verso is a detailed street map of Manhattan and part of the Bronx, Queens and Brooklyn. A striking piece of interest to both New York City map and brewery collectors. Philadelphia & London: Lippincott, 1934. First Edition. Very Good Plus/Near Fine. Philadelphia & London: Lippincott, 1934 First US edition. In the rare higrade dust jacket. The good Dr. Hailey solves a locked-room type mystery where the Banker meets his end on horseback chasing foxes. International intrigue in the hunt. Hard bound in original blue cloth with black decoration and titling. p. 312. Jacket with original price intact and pristine as the day it was printed. Noted is a neat gift inscription to the book's rear endpaper, else book is clean and unworn.. First Edition. Very Good Plus/Near Fine. RAILWAY MAP. No. 2 1934. 152 x 230 mm. In this design, the problem of confusion between the Central Line, coloured orange, and the Bakerloo Line, coloured red, was resolved by changing the Central Line to red and the Bakerloo Line to brown. Tiny mark on verso; else very good. DETECTIVE FICTION.) 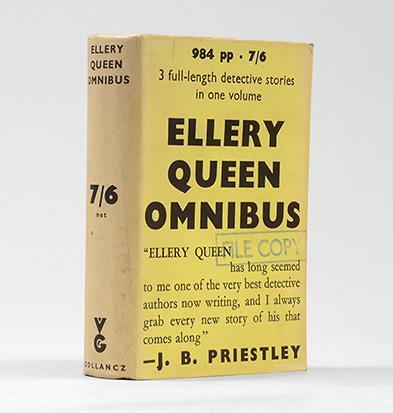 QUEEN, Ellery [pseud. of Frederic Dannay & Manfred Bennington Lee]. Arthur Barker, 1934 A first edition, first printing published by Arthur Barker in 1934. With Folding genealogical table. Bout in the original cloth, lightly worn and marked. The unclipped dust wrapper is edge-worn with some tears, though very little loss. Repaired tear to front panel. Bookplate to front free endpaper. Very good+ in like unclipped wrapper. Rare. New York Harrison Smith and Robert Haas [through 1935] MCMXXXIV  First American Editions (no additional printings noted) in First State bindings. Tall, thick 8vo's: 494, with with title page vignette and folding genealogical table of Tree of the Imperial Family and Connexions; 583,, with title page vignette and two folding genealogical tables, of the Royal Family of the Herods and of the Tree of the Imperial Family. Publisher's navy blue cloth, spines stamped in gilt, medallions stamped in blind (I, Claudius) and gilt (Claudius the God) on upper covers; pictorial dust jackets, I, Claudius priced $3.00 with "recommended by the Book-of-the-Month Club" decal on upper cover, Claudius the God unpriced and unclipped. (Speculation abounds as to whether this is actually the book-club issue, but aside from the unpriced jacket it is otherwise identical to the first trade edition. What's more, the jacket's back panel contains a list of 40 Smith and Hass titles, all priced, highly unusual for any book-club edition.) An uncommonly bright set, about Fine (evidence of neat, partial book plate removal from upper paste down of Claudius the God), in better than Near Fine jackets without tears or chips but spine panels faded (as inevitably). 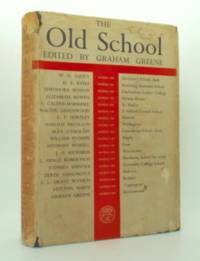 In 1934, Graves was awarded the James Tait Black Memorial Prize for both volumes. Higginson A42b and A43b. 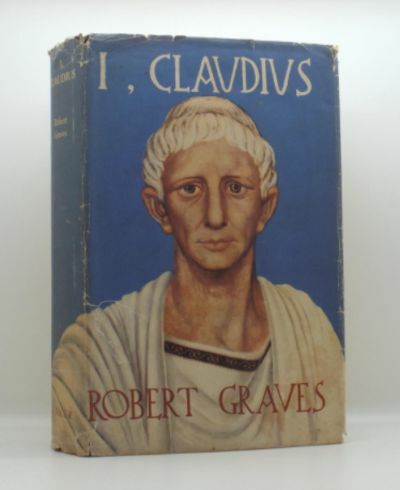 ¶ Graves's fictional autobiography of the Roman Emperor Claudius, using psychological realism in a story of political intrigue in first century Rome. Claudius the God and His Wife Messalina soon followed, and the publication of these books brought Graves international recognition and some financial stability. "Before Graves, this literary form was seldom other than a romance, contemporary to whatever age in which it was written and covered over with a thin veneer reminiscent of exotic climates and distant times and places. Graves, however, uses the form of the historical novel not to disguise the present but to explore and bring to light the past. . . . It is a measure of Graves's talent and skill that he can make his evocation of the past seem real and vivid, even to those with a solid grounding in the history of the early Roman Empire." 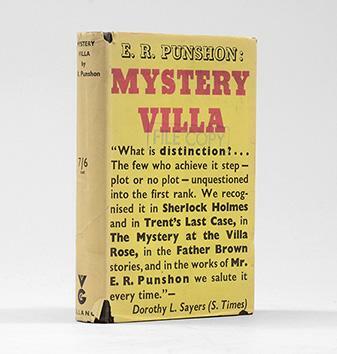 (Cyclopedia of Literary Characters) Note: With few exceptions (always identified), we only stock books in exceptional condition, with dust jackets carefully preserved in archival, removable polypropylene sleeves. All orders are packaged with care and posted promptly. Satisfaction guaranteed. Der Schulungsbrief: Sehr umfangreiches Konvolut fast aller erschienenen Schulungsbriefe der NSDAP mit den fast vollständigen Jahrgängen I - VIII: 1934, 1935, 1936, 1937, 1938, 1939, 1940, 1941. Lost Archive of 66 Glass Photographic Slides recording the Epic Trans-African Journey of Theresa Wallace and Florence Blenkiron from London to Cape Town in 1934. The sixty six glass slides of these two pioneering women form a valuable record of an epic journey across Africa on a Panther motorcycle and sidecar. Equipped with a revolver and fifty rounds of ammunition the two travellers headed straight across the Sahara, through Equatorial Africa and South to the Cape, for the most part off road and for the whole journey without even a compass. These images provide an insight into a remarkable adventure by two women who managed to overcome the prejudices and problems of their day as well as the physically demanding task of travelling some 7500 miles by motorcycle. DETECTIVE FICTION.) 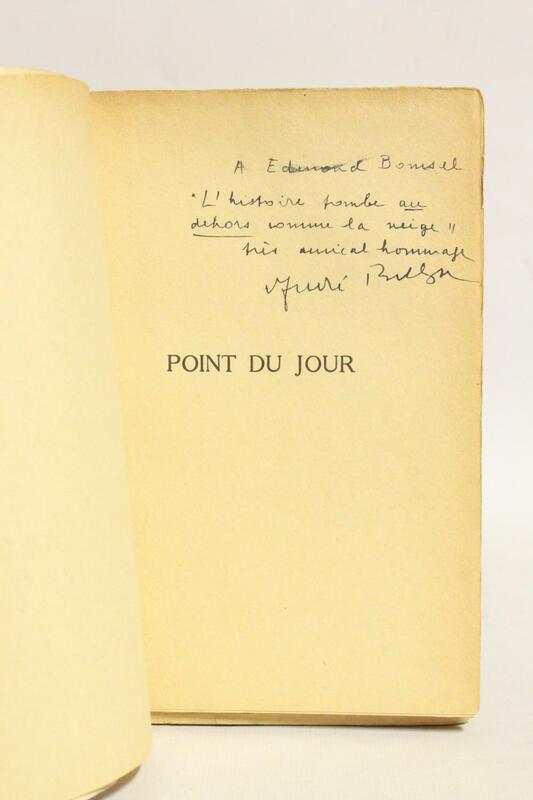 PUNSHON, E. R.
First Edition, as stated New York Harcourt, Brace 1934 First Edition, so stated, with the publisher's errata slip tipped tipped in between the copyright and dedication pages, denoting the first state. 8vo: ,302pp. 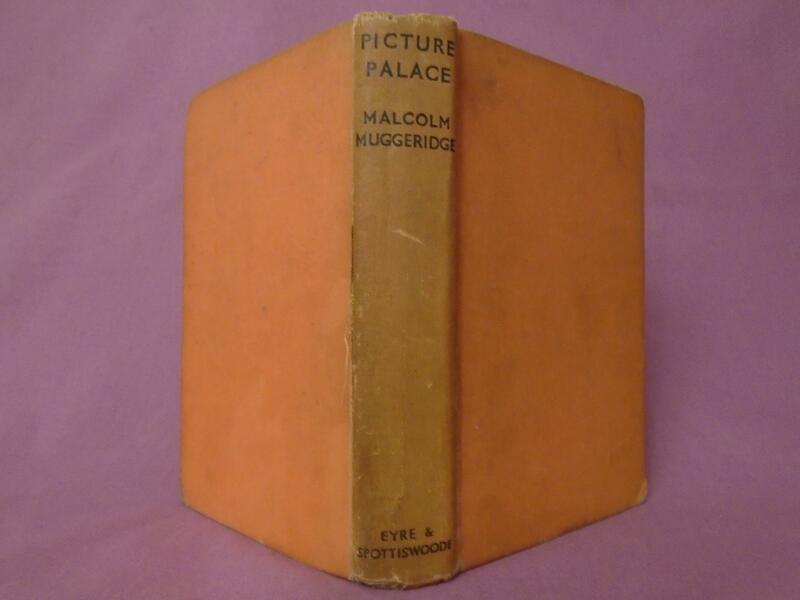 Publisher's black cloth, spine lettered in gold, top edge stained yellow; second-state pictorial dust jacket (with reviews on back panel), correctly priced $2.50. Fine, square and tight (positively unread), pages immaculate; in a Very Good, completely unrestored jacket, marred chiefly by a v-shaped, one-inch loss to head of the spine, affecting the letters 'ntment' and 'rra;' otherwise clean and vibrant. The author's seminal first novel, easily his most desirable and scarcest work. Bruccoli A2.1.a. Modern Library 100, 22. Time 100. Fine "O'Hara did for fictional Gibbsville, Pennsylvania, what Faulkner did for Yoknapatawpha County, Mississippi: surveyed its social life and drew its psychic outlines. But he did it in utterly worldly terms, without Faulkner's taste for mythic inference or the basso profundo of his prose. Julian English is a man who squanders what fate gave him. He lives on the right side of the tracks, with a country club membership and a wife who loves him. His decline and fall, over the course of just 72 hours around Christmas, is a matter of too much spending, too much liquor and a couple of reckless gestures. . . . That his calamity is petty and preventable only makes it more powerful." 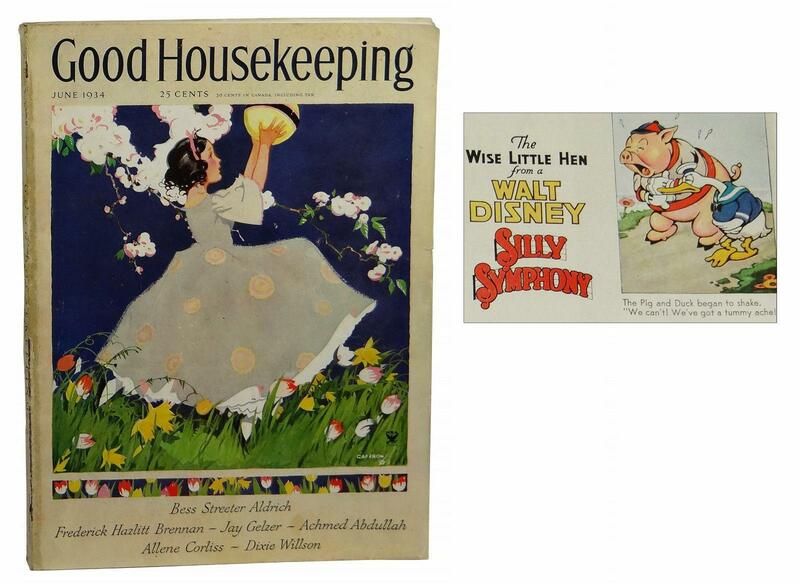 Time 100 Note: With few exceptions (always identified), we only stock books in exceptional condition, with dust jackets carefully preserved in archival, removable polypropylene sleeves. All orders are packaged with care and posted promptly. Satisfaction guaranteed. - Nrf, Paris 1934, 12x19cm, broché. - Prima edizione, una copia del servizio stampa. autografo firmato Irene Nemirovsky al signor Parmentier. Indietro insolated e ha due piccole lacrime piede minore. - [FRENCH VERSION FOLLOWS] Edition originale, un des exemplaires du service de presse. Envoi autographe signé d'Irène Némirovsky à monsieur Parmentier. Dos insolé et comportant deux petites déchirures sans gravité en pied. Litografia Nacional, Porto, 1934. - EA. Africa Ocidental Portuguesa (Malange e Lunda). 1. 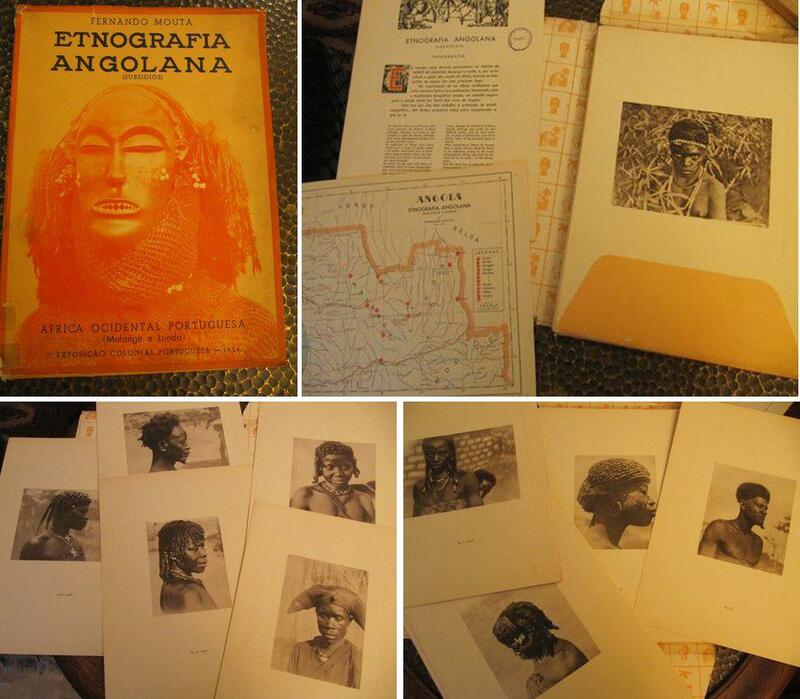 Exposicao Colonial Portuguesa - 1934. Mit 49 großformatigen , einzelnen, losen Tafeln auf starkem Karton mit jeweils einer fotogr. Abb. Weiterhin eine farbige Karten-Tafel auf Karton sowie 10 Seiten Text mit einigen Zeichnungen. Alles zusammen in einer Portfolio-Mappe. OPortf.-Mappe mit Deckel-Illustration. Folio-Format 34,5x25cm Umschlag berieben, bestoßen, teils mit kleinen Einrissen. Tafeln und Karte sehr gut. Bibl.-Expl. mit Spuren einer Rücken-Signatur sowie einigen Stempeln. Sehr seltene Fototafel-Mappe in ganz eigener Ästethik, irgendwo zwischen Kunst und Ethnologie/Anthropologie. 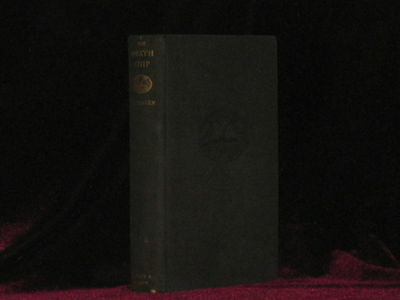 London: Methuen & Co.,, 1934-1937.. With a preface by A. A. Milne. [together with:] Babar's Travels; [and:] Babar the King; [and:] Babar's Friend Zephir. 4 volumes bound as one, large quarto. 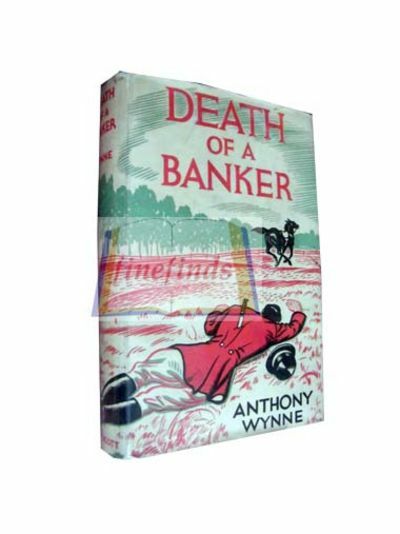 Finely bound by the Chelsea Bindery in orange morocco, titles to spine, pictorial multi-coloured onlay to front board copied from the original, dark blue endpapers, original pictorial endpapers bound in, gilt edges. Illustrated throughout. A fine copy. 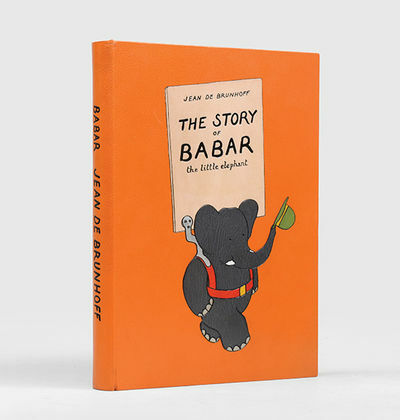 First UK editions of the first four Babar stories. These four books together with Babar's ABC were the only Babar books to be published during Jean de Brunhoff's lifetime.